DexCom's SEVEN System Provides Seven Days Of Continuous Blood Glucose Monitoring | OhGizmo! As if the health and physical problems weren’t enough, people with diabetes also have to deal with testing their blood sugar on a regular basis, which usually involves pricking a finger to get a blood sample. 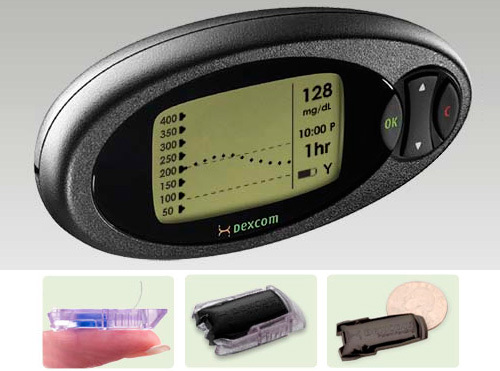 The SEVEN system from DexCom however uses a flexible, platinum wire-based device that goes under the skin to continually read glucose levels for a period of seven days. The sensor is currently the smallest on the market (about the size of a quarter) and it attaches to your skin via a waterproof adhesive patch so you can wear it non-stop for an entire week without any special care. The sensor also features a wireless transmitter which sends information about your blood glucose level to a receiver every 5 minutes, providing a more comprehensive record of your sugar levels on an hourly basis. The SEVEN receiver, which is about the size of a cellphone, has a large LCD display which can be used to show graphs of your blood glucose level over 1, 3 and 9-hour periods. It also has a set of high and low blood glucose alerts that can be customized to your needs, and a Hypo-Safety-Alarm that will alert you when your glucose falls to 55 mg/dL or lower. Since the transmitter on the sensor runs on a minimal amount of power, the range between the sensor and the receiver is limited to about 5 feet, so you’ll always need to keep it on or near your person. But if you can get a prescription for it from your doctor, and it’s reasonably priced, it could be a far better alternative to pricking your finger every morning. Thanks for the head's-up on this device, Andrew! As a Type-1 diabetic, I can really use something like this. This appears to be a promising new technology to help with blood sugar control. Diabetes is, by itself, a significant health challenge but its complications are substantial health risks. Gum disease, for example, interferes with maintaining a normal blood sugar range and interacts with high blood sugar levels in ways that worsen both conditions. Fortunately, good dental therapy can reduce blood sugar and even reverse gum damage. We write about this extensively at http://dentistryfordiabetics.com/blog. This is so handy. I've found it very difficult to get my strips at an affordable rate, and have resorted to using an offshore pharmacy. This should make it a lot easier to keep track of my blood sugar – and cheaper too. I was diagnosed with Type 2 Diabetes approximately 3 years ago. My A1C Sugar level was at 10.7. My doctor immediately prescribed Avandamet 4/1000 and it began to have an immediate positive impact on my sugar control. As of April of 2008, my last A1C was a remarkable 5.7 and my doctor is very pleased with the effectiveness of the drug. Glucophage (metformin) for Diabetes, Type 2: I have been taking Glucophage for 11 years. I have never had any side effects at all and my blood sugar level is always good.